A donation can help patients whose organs are not working properly or failed, are declared as a “transplant candidate” by the doctors and need an organ transplant to survive. As per Transplantation of Human Organs Act 1994 and its amendments in 2011, organs and tissues can be donated after death. Either in case of brain death or cardiac arrest/natural death, individuals may donate their organs and tissues. 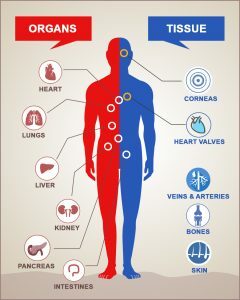 Currently in India, solid organs and tissues are harvested from brain dead patients and tissues can be donated in case of natural death/cardiac arrest.